The middle classes hate automatic checkouts. They claim it is because the supermarket machines are too impersonal, or because they never work. But these are just excuses. The real reason is obvious: middle class people think checking their own food is beneath them. Look at the critics. They always fall into one of three categories. First, there are the yummy mummies who only visit the supermarket once a year. They will stare at the automated checkouts with a mixture of contempt and disbelief until an attendant scans the goods for them. Second, there are the hipsters who object to supermarkets for philosophical reasons. They blame automated checkouts for just about everything: from the atomatisation of society to famine in Africa. Third, there are the country bumpkins, who stand at the automatic checkouts forlornly waving a packet of Rich Tea biscuits. Although the technology is designed so that children could use it, these Luddites argue that the machines are too complicated, too fickle, and poised to take over the world. In each case shopping is something they would rather not do themselves. 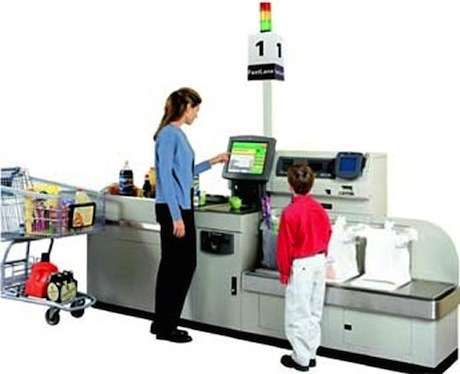 Automated checkouts are a brutally functional reminder of our basic needs. Middle class people hate automated checkouts for the same reason they hate supermarkets: they think they are a bit common. But this is a shame. Because supermarkets are the furthest evolution of capitalism. And with automated checkouts, they show us the future of shopping. Automated checkouts make the queues shorter. Much shorter. Indeed, if every shop had automated checkouts, queues would be a thing of the past. They would be described in the same fond, forgetful way as minidisks or the hole in the ozone layer. Also, no one else can see what you buy. Before, all sorts of goods and products were off-limits because of their potential embarrassment. But now you can walk up to the automated checkout, basket groaning with protein shakes and super blonde shampoo, but head held high. Finally, automated checkouts are fun. Scanning the items as quickly as possible makes each trip to supermarket into a game. Not only can you race the people around you, but with a regular shop you can try to beat last weekâ€™s time. Despite tradition, self-service is in fact the height of luxury. Because, as automated checkouts show, self-service sets you free.